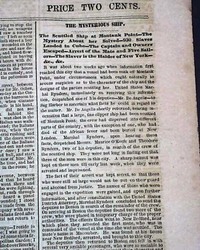 NILES' WEEKLY REGISTER, Baltimore, Sept. 30, 1820 The back page contains a very brief yet interesting item reading: "Lafitte's armed brig is in the river--the crew having mutinied and put her officers on shore, brought her in, and delivered her up to the officers of the customers at the Balize." 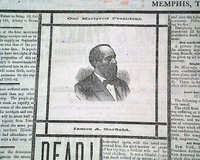 which was provided by the the New Orleans Advertiser newspaper. 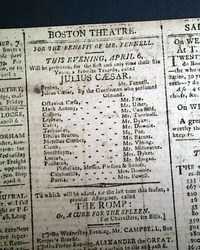 (see). 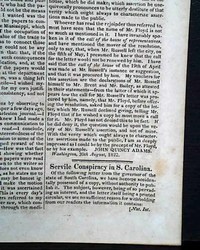 NILES' WEEKLY REGISTER, Baltimore, Sept. 7, 1822 Pages 9-11 have much regarding Denmark Vesey and the "Servile Conspiracy in South Carolina," which has a report of the Denmark Vesey slave revolt. 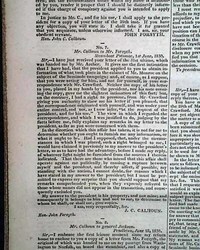 NILES' WEEKLY REGISTER, Baltimore, March 5, 1831 Fourteen of the 24 pages of this issue are taken up with: "Correspondence Between Gen. Andrew Jackson and John C. Calhoun" most of it relating to the Seminole Indian War. 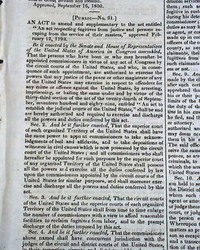 Included are 7 letters signed: Andrew Jackson, 9 letters signed: J.C. Calhoun, and 2 letters signed: James Monroe plus one by John Quincy Adams. 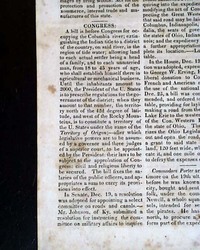 This large sized issue measures 24 x 18 inches, contains news of the with several interesting advertisements. 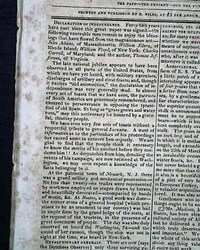 Complete with 4 pages, a little wear at the folds with a few tiny holes within masthead, generally in nice condition. 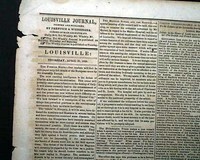 THE LOUISVILLE DAILY JOURNAL, Louisville, Kentucky, April 26, 1849 Rare to find a Kentucky newspaper from before the Civil War. The entire ftpg. 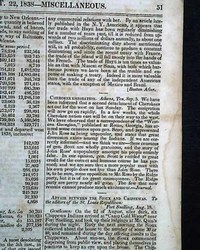 and back page taken up with ads, providing interesting insight into the goods purchased by families over ten years before the Civil War. 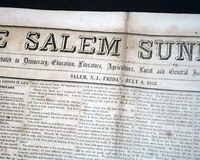 Inside pages have various news of the day, including political items, and even more advertisements. 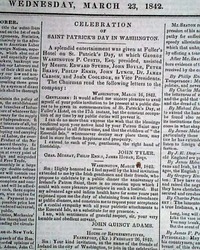 * St. Patrick's Day meets the Temperance Movement in Washington, D.C. 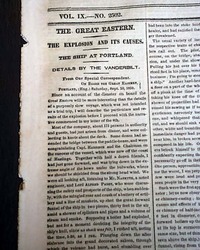 The front page has an article headed: "The Great Eastern" "The Explosion And It's Causes" Lengthy text. 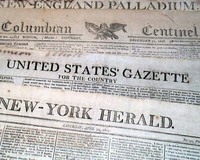 DAILY NATIONAL INTELLIGENCER, Washington, D.C., September 19, 1850 Being the mouthpiece of the federal government it was typical that reports & documents emanating from Congress would appear in print first in this newspaper. 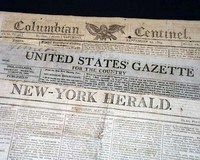 Collectors always desire to have notable governmental reports in newspapers from the nation's capital. 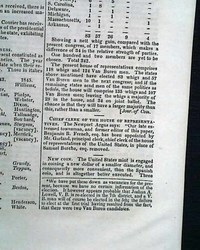 FRANK LESLIE'S ILLUSTRATED, New York, Jan. 26, 1856 Ftpg. 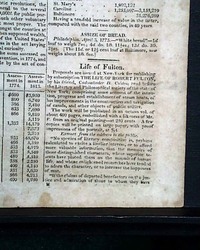 features a print of "Hon. N.P. Banks of Mass...". Prints inside include: "The Superga Cathedral, Turin" & other Turin scenes; "Church of St. Columba, Minnesota Territory" and some railroad scenes along the Hudson. Sixteen pages, minor margin tears, nice condition. 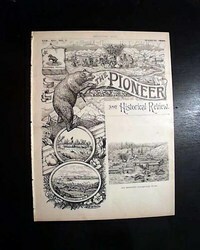 THE PIONEER & HISTORICAL REVIEW, San Francisco, March 15, 1899 A very ornate, full page title page which includes a print of: "Old Hangtown (Placerville) in 1850". 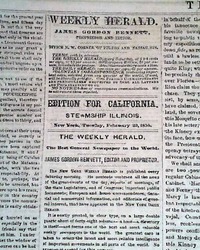 An interesting publication which focused on the history of California. 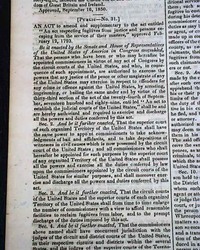 Sixteen pages, 10 by 13 1/4 inches, very nice condition. 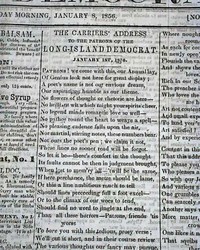 LONG ISLAND DEMOCRAT, Jamaica, Queens County, Long Island, New York, Jan. 8, 1856 The front page has 1 1/2 columns taken up with: "The Carrier's Address to the Patrons of the Long Island Democrat", the significance of which can be found on the web. 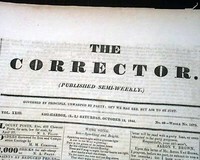 THE CORRECTOR, Sag Harbor, Long Island, New York, Oct. 19, 1844 An uncommon title from this once-famous whaling town near the eastern end of Long Island, now more famous as a playground for the rich & famous who frequent the neighboring Hamptons. 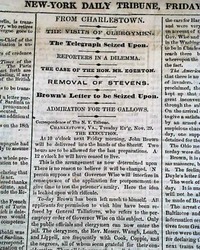 NILES' WEEKLY REGISTER, Baltimore, July 11, 1818 The ftpg. 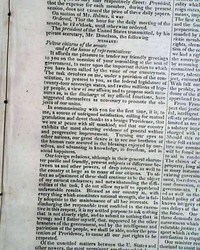 begins with: "Declaration of Independence" reporting on celebrations of the 4th of July & beginning: "Forty-two years have past since this great paper was signed..." and noting the 5 signers still living. The ftpg. 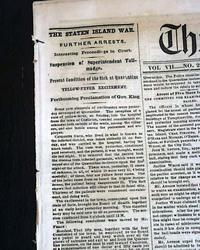 has headlines & text on: "The Staten Island War" "Further Arrests" "Suspension of Superintendent Tallmadge" and more (see photos). 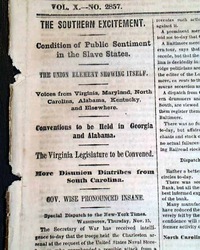 From a few months before the outbreak of the Civil War, the front page has: "The Southern Excitement" "Condition of Public Sentiment in the Slave States" "The Union Element Showing Itself". More similar reports on 4. 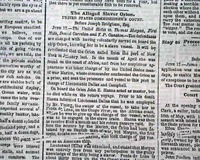 The front page has an article headed: "The Alleged Slaver Orion" See images for text here. 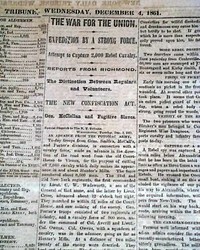 Other news of the day just prior to the Civil War. Complete in 8 pages, a few printing flaws, generally nice. 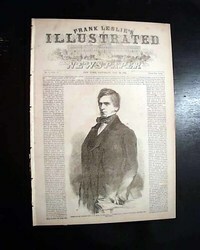 BALLOU'S PICTORIAL, Boston, March 3, 1855 The ftpg. 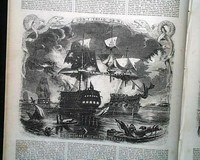 has a nice print: "A Sleighing Scene Near Boston" with related text. 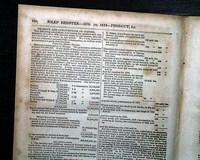 Prints inside includes scenes of Constantinople, "Homme Richard & Serapis" "Constitution & Guerriere", 2 prints from Gettysburg, and a map of "Sepastopol and Balaklava". 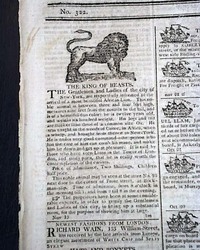 BOSTON COMMERCIAL & POLITICAL GAZETTE, Nov. 27, 1802 The top of the front page has a notice for an exhibit of A beautiful African Lion which includes details about the event and a woodcut of a lion. Light foxing. 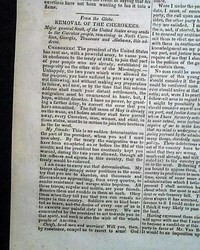 THE WEEKLY REGISTER, Baltimore, March 14, 1812 Near the back is a brief yet interesting article headed: "Pleasing Sketch of Zanesville", Ohio, describing it as it was in 1812 (see). Sixteen pages, 6 by 9 3/4 inches, a tear at the spine, boxing to the upper right (see), otherwise good condition. 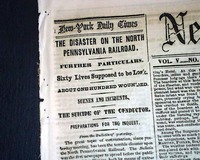 The front page has an article headed: "THE DISASTER ON THE NORTH PENNSYLVANIA RAILROAD" "Further Particulars" "Sixty Lives Supposed to be Lost" and more with list of the killed. (see) Text takes up over 2 columns. 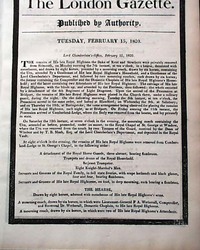 THE LONDON GAZETTE, England, Feb. 15, 1820 Pages 1, 2 and 3 have fine & very detailed reporting on the funeral for the 4th son of King George III. The ftpg. begins with: "The remains of His late Royal Highness the Duke of Kent and Strathern were privately removed from Sidmouth...in a hearse, decorated with escocheons & drawn by eight horses..." with further details. 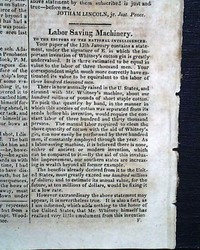 GAZETTE OF THE UNITED STATES, Philadelphia, June 28, 1803 The back page has a small advertisement for "The Rev. 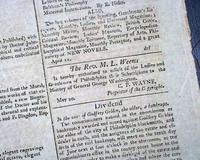 M. L. Weems", more popularly known as Parson Weems, the ad noting: "Is hereby authorized to solicit of the Ladies and Gentlemen of Philadelphia their subscriptions to the History of General George Washington." 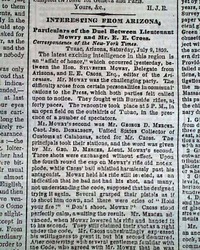 NEW YORK TIMES, August 5, 1859 The front page has an article headed: "Interesting From Arizona" "Particulars of the Duel Between Lieutenant Mowry and Mr. E. E. Cross". See images for text. Eight pages, very minor spine wear, nice condition. 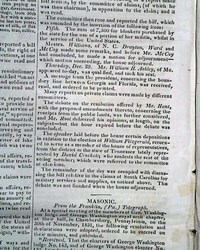 THE PITTSBURGH RECORDER, Pennsylvania, January 3, 1823 The volume 1 number 50 issue of a quite uncommon and very early periodical from Western Penna. 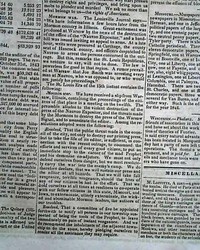 THE DAILY UNION, Washington City, July 29, 1846 The ftpg. 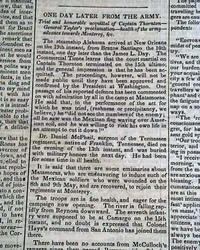 has a great wealth of reporting on the Mexican War. 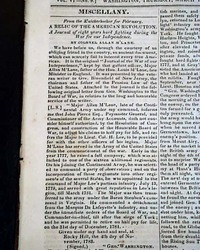 Some of the column heads include: "One Day Later From The Army" "Trial & Honorable Acquittal of Captain Thornton--General Taylor's Proclamation--Health of the Army--Advance Towards Monterey". 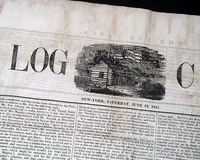 THE LOG CABIN, New York, June 12, 1841 The famous campaign newspaper published by Horace Greeley in support of William Henry Harrison in the 1840 election, its success carrying over to many issues beyond the inauguration--including this one. 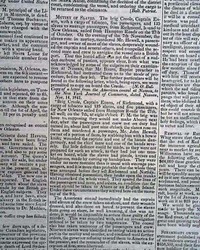 Four pages, an engraving of a log cabin in the masthead, some foxing generally good. 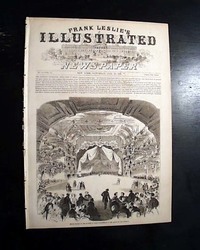 FRANK LESLIE'S ILLUSTRATED, New York, Jan. 19, 1856 Among the prints within are a view of: "Copenhagen" "The Emperor Alexander II of Russia in the Streets of St. Petersburg" "Horse Bazaar at Constantinople" "Genoa", Italy; 3 scenes from Japan; a fullpg. 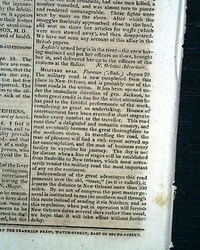 of: "Jackson--Battle of New Orleans". 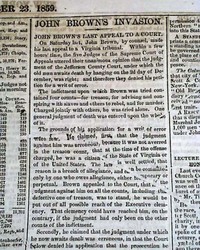 NEW YORK TRIBUNE, Nov. 23, 1859 Page 5 has over a full column taken up with "JOHN BROWN'S INVASION" "John Brown's Last Appeal to A Court" with a subhead: "The Virginia Fright". Nice content on is involvement in the Harper's Ferry Insurrection. Eight pages, a few small margin tears, generally good condition. 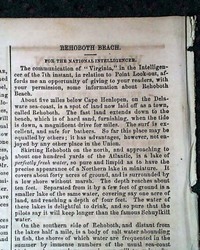 NILES' WEEKLY REGISTER, Baltimore, April 19, 1817 The most interesting article is: "African Colonization" which is introduced by: "The following is an extract of a letter written by Thomas Jefferson..." datelined at Monticello, Jan. 21, 1811, and signed by him in type: Thomas Jefferson.